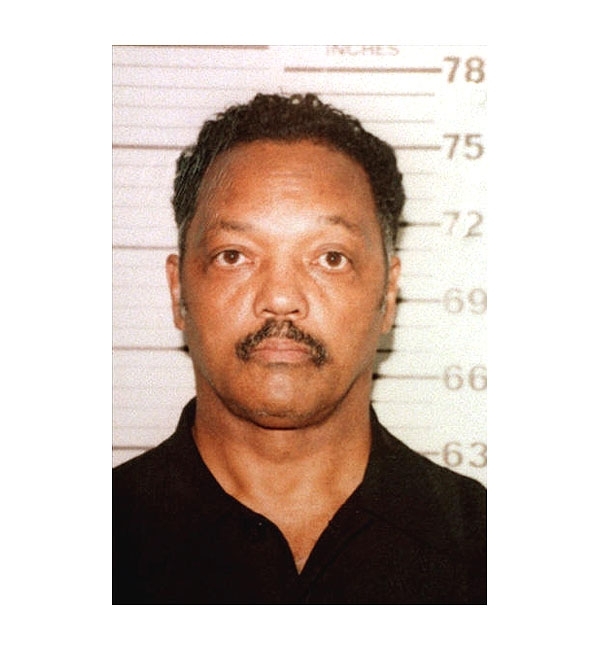 Jesse Jackson was arrested by Decatur, Illinois cops in December 1999 and charged with criminal trespass and contributing to the delinquency of a minor in connection with a demonstration at a local high school. The civil rights activist was protesting the expulsion of six students who were kicked out of school for fighting. Submitted by bonecrusher on Sun, 2011-05-22 23:29.
his eyes are very wide set. Submitted by greglisi on Wed, 2011-03-23 19:13. He has extorted so so many companies for so much money. Imagine ? they call him Reverand !. . a real sham , ,I mean shame ! Submitted by clairpie on Tue, 2011-03-15 15:20. He is nothing but an ambulance chaser. Submitted by Jerjerrod on Sat, 2011-01-29 02:15. I found is hilarious that he was so adamant that these six punks be allowed back into school that he ignored the judge's order to stop interfering with the schools there. When he got arrested and they fined the hell out of him, he stopped coming back. Guess he will only put the money his 'organization" gets from the government where his mouth is, or rather where his 'girlfriend' and illegitimate child are. Some logic Jesse. Six punks, a couple who are in the ninth grade for the second and third time, jump ONE guy at a football game and get kicked out for it, but you take their side. Yeah, nice guy, way to go there Jesse. Too bad about the kid that got jumped six to one huh? Where were you when he had that happen to him? Submitted by kmarcy89 on Tue, 2011-01-18 19:31.
the words hypocrite, you ignorant mouth breather. This mug shot has nothing to do with his infidelity. He was protesting about 6 black teens being assaulted and the white locality doing little to nothing to protect them. If you want to express your ignorant opinions about someone, get a twitter, you fool. Submitted by boofer6970 on Sun, 2010-08-22 21:58.
hipocrate of the year - how dare you to council the president of infidelity when you do it yourself !!! how is your love child hipocrate !!! !